Two innovations made possible the development of the decorated publishers’ binding. First, case construction made the decoration of covers less risky; previously, one mistake in decoration meant that the whole binding was ruined. Second, a modification of the cast-iron printing press made it possible to stamp a long run of covers in full size and without frequent reheating of the stamping dies. In the eighteenth century, an all-wood “arming press” had been used to gold-stamp customers’ coats of arms on the sides of completed books. The engraved brass die would be heated away from the press, then quickly placed on the book in the press (1). Only one long pull could be made before the die cooled and had to be reheated. The pressure of the all-wood press was limited, which limited the size of block that could be stamped: larger than a hand tool, but still much smaller than the entire cover. Earl Stanhope’s iron printing press (circa 1800) was no faster in pulls per hour than a common wooden press, but the pressure of the screw was increased by a system of levers, which effectively doubled the area printed per pull from half a sheet to a full sheet. It was followed by a slew of other iron hand presses, each with a slightly different mechanism: Columbian, Albion, Washington, Smith, Wells, Rust, Stansbury… In most of these, “toggle-joint” levers replaced the traditional screw. For printers the iron construction mostly served to keep the powerful levers from breaking the frame. For binders, however, the iron frame meant that a die could be heated in place in the press, and this meant that a long run of hot-stamping could go on without interruption (2). It took several decades before the new iron press worked its way into binderies. Before the development of case binding in the 1820s, the cover was already on the book before finishing; in consequence, stamping it all at once was unduly risky— one mistake might ruin the entire binding and waste all the work of the forwarder. With case construction, however, a mistake in stamping ruined only the case, which could be remade easily (3). Now, a large part of an edition could be bound in relatively inexpensive but elaborate covers; indeed, covers could be prepared before a book was completely printed or even written, allowing preparation in advance of Christmas gift books and other short-deadline but highly decorated, even gaudy, work. This was almost the first application of machinery to bookbinding, and led to an entirely new aesthetic of binding design. The “Imperial” printing press (4) was introduced by Messrs. Cope & Sherwin around 1828-1829. 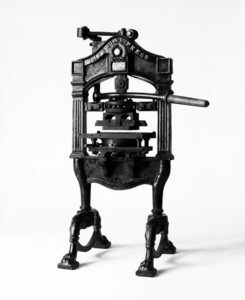 It was one of the many second generation hand press designs; it combined the compound levers of the Stanhope with the toggle-action that replaced the screw in the Albion and other presses, and had a lighter frame replacing the heavy Stanhope frame. It is not clear why the Imperial mechanism found favor with binders while similar iron printing presses did not (5). James Moran suggests that the Imperial was favored for conversion to a hot stamping press because of its power (6); I would suggest that it also has less clutter under the arch than many other hand presses (7), giving better access in manipulating the covers, more room for the thickness-adjusting mechanism, and making management of the heating bars more convenient. In any case, Imperial presses purpose-built for binding had appeared by 1832. The earliest description, in the Mechanics’ Magazinein that year, includes a plate of a single-column press incorporating the Imperial mechanism; the same illustration is used in the first edition of Arnett’s Bibliopegiain 1835, with a detailed but different description. Despite its imposing appearance, the brittle cast iron of the period probably made the single-column frame somewhat fragile (8). Arnett re-used his 1835 text on the arming press in his 1865 sixth edition, but he accompanied it with a new illustration of a conventional double-column press much more like the printing-press version and almost exactly like ours except that the proportions of Arnett’s cut suggest a larger size. Although our example was discovered already restored in France, it was made by Hampson & Bettridge in London, sometime after the partnership succeeded William Hampson in 1860 (9). By this time arming presses were heated by steam or gas, the gas jets firing in the tunnels originally meant for hot iron bars (10). Moran says that Hopkinson & Cope, a major English printers’ pressmaker, offered Imperial arming presses as late as 1871 (11); the 1891 catalogue of Harrild, a major binders’ supplier, included several sizes of arming presses which were to all appearances the old Imperial (12). Even in this first bastion of machine work, hand work still held a place: for another century, into the 1920s, each cover had to be “glaired” with an albumen solution as adhesive, and then covered with loose gold leaf, all meticulous hand work, before the die could be stamped and the excess gold wiped away. This highly skilled but repetitive work was often done by women and children, the lowest-paid workers in the bindery. Arnett, John Andrews (pseud. of John Hannett). Bibliopegia; or, The Art of Bookbinding, in all its Branches.London: Richard Groombridge, 1835. (Reprint of the first edition New York and London: Garland Publishing, 1980). “The Arming Press” pp. 170-172, and frontispiece. ——–Sixth edition London: Simpkin, Marshall, and Co., 1865. (Reprint of the sixth edition New York and London: Garland Publishing, 1990.) “Arming Press” pp. 361-363, with illustration p. 362. Baddeley, W. “Imperial Arming Press.” Mechanic’s Magazine.Vol. 17, No. 472 (August 25, 1832), pp. 337-339. Comparato, Frank. Books For The Millions.Harrisburg, Pennsylvania: Stackpole, 1971. Harrild and Sons’ Complete Illustrated Catalogue of Bookbinders’ Machinery, Materials, Rolls, Tools, Corners, etc.London: Harrild & Sons, 1892 (reprint Sydney, NSW: Guild of Craft Bookbinders, 1988). (1) Dudin is ambiguous concerning whether dies used in the press were heated: in discussing gold tooling with small tools he insists on the necessity of heat when applying gold, but he mentions no heating step in describing blocking the sides; see Atkinson translation pp. 60-62. The arming press would have necessarily given a long dwell on the block, so it would have been warmed only slightly if at all; dies were mounted on cardboard for cushioning the force of the press, and this too also suggests just slight warming (too hot and the cardboard would catch fire). However, until I have done experiments I find it hard to believe in gold tooling with egg glaire and entirely without heat. (2) The first continuous-run stamping probably took place in enormous dumbell-armed “fly presses,” shaped rather like nipping presses ten feet across and capable of up to eighty tons of pressure. These were used to create deeply-embossed cases in blind, and continued in use for this purpose at least into the 1840s; the arming press was used for designs which were pressed shallowly into an area that was smaller, though well spread out, and therefore didn’t need the extreme pressure of the fly press. However, the fashion for “cathedral bindings” and other products of the fly press did not last for long. (3) It became standard practice, probably quite soon, to make a slight excess of cases to allow for errors in stamping and casing-in. (4) The term “Imperial” was used for a size of paper as well as for a design of iron handpress, and this can lead to confusion, since the size of a hand press was specified by the largest sheet it could print. Thus, one could talk of a foolscap Albion, a royal Columbian, or a double-crown Imperial; similarly, one could talk of an imperial Albion, an imperial Columbian, or even an imperial Imperial. (5) Hopkinson and Cope offered “steam Albion arming presses,” for instance, but references to them are rarely encountered, while references to the Imperial seem relatively common. See Moran pp. 95-66. (6) Moran p. 94. Moran’s form of words suggests the after-market conversion of Imperial printing presses into stamping presses rather than (or as well as) the manufacture of new Imperial stamping presses, but it is unclear whether there is any contemporary evidence to back this suggestion up. At any rate, the single-upright Imperial shown in the Mechanic’s Magazineand by Arnett was certainly not made for printing. (7) The mechanism of the Imperial press, whether printing or arming, is to a great extent hidden inside its frame. This would make repair or tuning harder, which perhaps is why the Imperial failed to gain great popularity among printers; the exposed levers of other presses would not bother printers running their paper with tympan and frisket. (8) Double uprights remained normal for blocking presses for the rest of the 19th century. In the early 20th century smaller single-upright designs became common; this may have reflected a wider use of steel, malleable iron, and other improved alloys replacing the old brittle crude cast iron. (9) William Hampson appears in the London Post Office Directories at 47 & 48 Old Bailey through 1860; the firm of Hampson & Bettridge appears at the same address in 1861. Later advertising gives a foundation date of 1795 for the firm, but that would not affect the dating of our press. Hampson & Bettridge joined N.J. Hill sometime between 1911 and 1936, and finally went out of business in the early 1960s. They were the most prominent bookbinders’ pressmakers in England for the best part of a century. (11) Moran p. 96. The Cope of Hopkinson & Cope was Richard Whittaker Cope, the inventor of the Albion press, who died in 1828; he was apparently the father of John Cope, the partner in Cope & Sherwin, but the firms were unconnected. Ibid pp. 91-96. (12) Harrild’s 1892 catalogue p. 21. This may, of course, have been the re-use of old printing blocks to save the expense of cutting new ones with up-to-date machines. The fluted columns of the old Imperial design look distinctly odd in an 1890s context.